It’s been almost a week since a 7.8 magnitude struck Nepal, and the death toll so far has climbed above 5,500 people across about 30 mountainous districts. More than 100 aftershocks, a few registering above 6.4, have worsened the destruction and posed severe challenges for the relief effort. 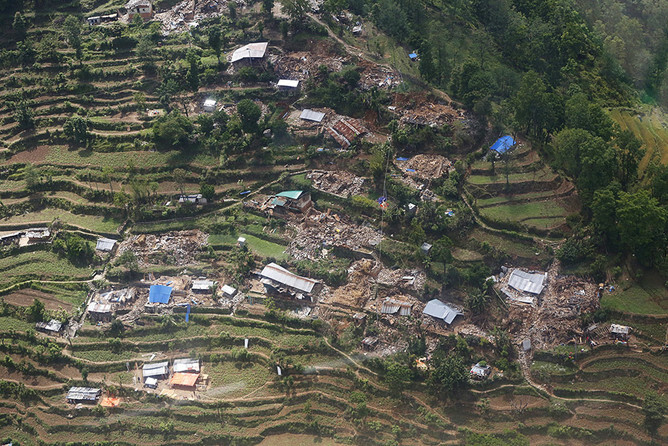 Many villages in the central Himalayan region were completely wiped out. While the full assessment is still not complete, and the rescue operation has yet to reach many of these remote places, initial estimates show that 80% of the 60,000 houses in just one district have been damaged – a figure that may reach as high as 200,000 for the country. The immediate priority, of course, is to provide these villages with medicine, food and shelter, while trying to save as many lives as possible, but soon the attention will turn to the economic cost of the disaster – with some estimates exceeding the country’s total gross domestic product – and what it will take to get Nepal back on its feet. Here’s a preview of what that will look like. Nepal already was among the poorest and least developed countries in the world. About a quarter of its 31 million people live below the poverty line. Remittances from Nepalese around the world make up 22% to 25% of GDP. Unemployment is above 40%. While agriculture is the primary industry, supporting more than 70% of the population and more than a third of GDP, tourism still plays a very important role, responsible for about 8.6% of the economy thanks to the more than 800,000 people who visited in 2014. The tourism sector is also estimated to support more than a million Nepalese jobs, both directly and indirectly, or more than 7% of the workforce. It will likely suffer lasting damage from the earthquake. The mountainous areas most affected, both to the east and west of the capital, Kathmandu, fall within a geographic region popular for tourism-related activities – such as ascending the world’s highest peak – including the Pokhara and Annapurna circuit, Gorkha and Manaslu trekking area, Langtang and the Khumbu Everest area. Many roads across these hilly regions were damaged and base camps wiped out following a series of avalanches. 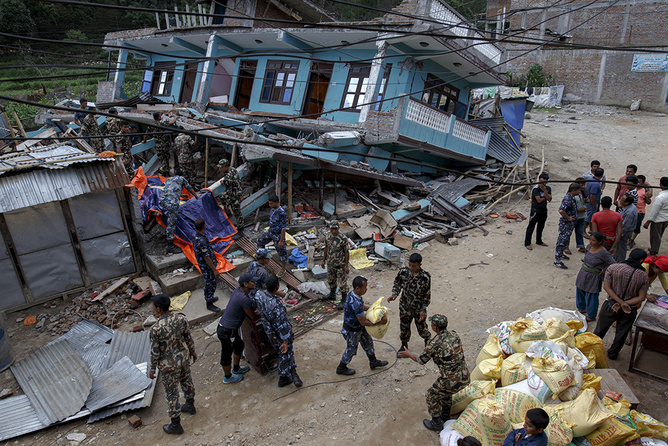 The tourist hub of Pokhara, west of the epicenter, was spared, whereas Kathmandu city was not so lucky. Kathmandu itself is the economic center of Nepal, contributing 25-30% to GDP. It is the center of banking, information technology, media and education, as well as central government offices. Here is where the economic impact was likely most severe. 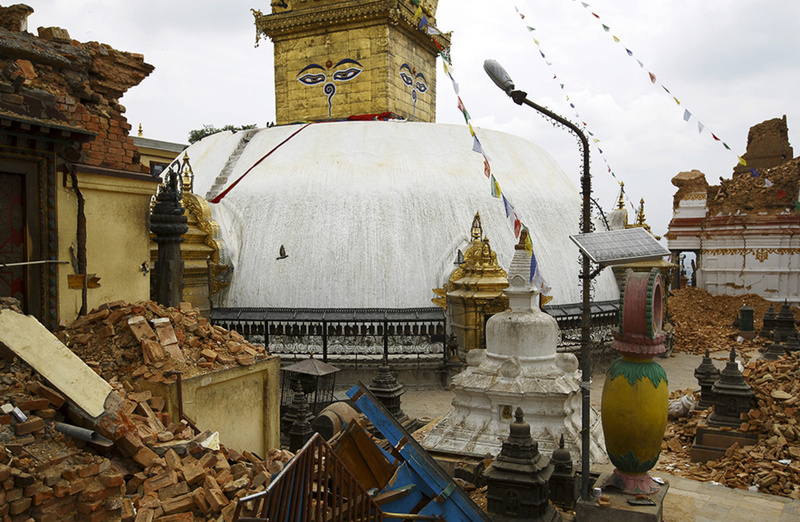 Its world-renowned cultural heritage sites were damaged significantly, a heavy blow to tourism and the country’s heritage. Kathmandu Valley represents an ancient Bagmati civilization consisting of four city kingdoms. In essence, it is a living museum, and the cultural landscape of the valley has always been a major attraction for anyone visiting Nepal, whether for trekking, recreation, eco-tourism, safari or religious pilgrimages. Four of the nine world heritage sites in the valley and their culturally iconic temples and buildings in these squares have been massively damaged. So it will certainly change Nepal’s tourism business, but the impact on its cultural landscape will create a deep scar. The Nepalese have already had to rebuild this heritage once, back in 1934, when the last major earthquake struck, killing more than 10,000 people. Nepal’s master artisans of the valley can do it again if they get enough resources from the international community. This is utterly vital because not only because the whole valley economy depends on these cultural icons, but also because it will affect many other tourism-related economic activities all across Nepal. Nepal’s energy industry may have also suffered significant damage from the temblor, affecting both power plants and the infrastructure crisscrossing the rugged landscape. Two of its largest hydropower facilities are located in the hardest-hit areas, the 144-megawatt Kaligandaki to the west of the epicenter and the 22.1MW Chilime plant north of Kathmandu along the Langtang trekking route. The extent of the structural damage is still not known. In general, many run-of-the-river type hydro plants that depend upon the diversion tunnels will also be affected by such a massive earthquake. An energy-starved country like Nepal will have to reexamine its project designs. Many rural families depend upon the remittances sent by their family members from countries such as the Middle East, Afghanistan, Iraq, Israel, Malaysia and South Korea. At least three million Nepalese are living abroad. That presents an entirely different problem in terms of rebuilding, with so many of the male members of households away from home, leaving the wives and mothers they left behind more vulnerable in a disaster. Every day about 1,500 people leave Nepal for nearby job opportunities as migrant workers, most of whom are male. It has affected female household members living in rural areas significantly, overburdening them with extra responsibilities that they often have to handle on their own, such as raising children while also looking after the agriculture land. This makes the recovery extra hard, whatever the finally economic toll. The US Geological Survey estimated that the economic losses from the earthquake will most likely be US$1 billion to $10 billion but may tally tens of billions more. It said there’s a 13% probability that the devastation could reach more than $100 billion. That compares with Nepal’s $19.2 billion GDP. Other estimates have been a little more conservative. Rajiv Biswas, the chief economist for the Asia-Pacific region at US-based consultancy IHS, put the cost to rebuild at $5 billion over five years, the Wall Street Journal reported. By comparison, Typhoon Haiyan, which struck the Philippines in 2013, caused $10 billion in economic damage, while Haiti’s 2010 earthquake resulted in $8 billion in costs, according to the WSJ. How much foreign aid pours in will be key to whether Nepal is able to cover such high costs to restore so much devastated roads, utilities and other infrastructure. So far the Asian Development Bank has pledged $200 million, while dozens of governments and aid organizations have promised or donated tens of millions more. The speedy response offers hope there will be enough aid to repair the damage. It’ll be some weeks before we know the full scale of the costs from this disaster, whether in terms of lives lost or economic damage. But we do know both will be very high. They could have been lower, however, if the government had been better prepared, particularly in terms of building more robust infrastructure and ensuring houses could withstand earthquakes. The government of Nepal has known about this impending disaster for a long time. Many workshops were taking place in Kathmandu around the idea of earthquake preparedness, but little was being done. 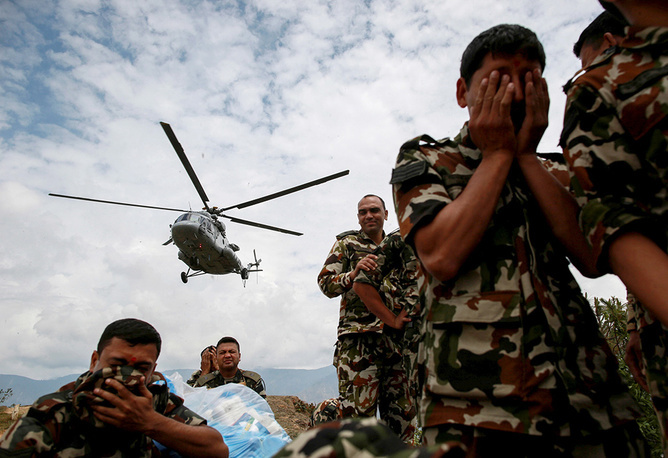 Nepal’s messy politics has also hampered the response. The government should have immediately set up a command center and assigned a coordinator to oversea the rescue effort, such as a young, energetic and experienced army general. Instead foreign countries have spearheaded the sometimes uncoordinated efforts. Many are working very hard to pull through this crisis, and it is still not too late to do so. Historically, the two neighbors – India and China – were seen as rivals in terms of dealing with Nepalese affairs. In this case, both of them were among the first responders to lend support. This could spark a new era of regional cooperation and economic partnership for Nepal. That is, instead of getting hung up on a China versus India type rivalry mentality, Nepal should reach out to both for a trilateral cooperative agreement. I proposed this back in 2010 as the Trans-Himalayan Economic Cooperation Agreement. Many others have shown support for such a cooperative agreement and have urged Nepal to move in that direction. Nepal has much to offer in terms of its hydro-power potential, tourism, and highway linkages between China and India, opening up new markets for all three parties. And of course Nepal itself would gain significantly from the increased investment from both countries, particularly now. 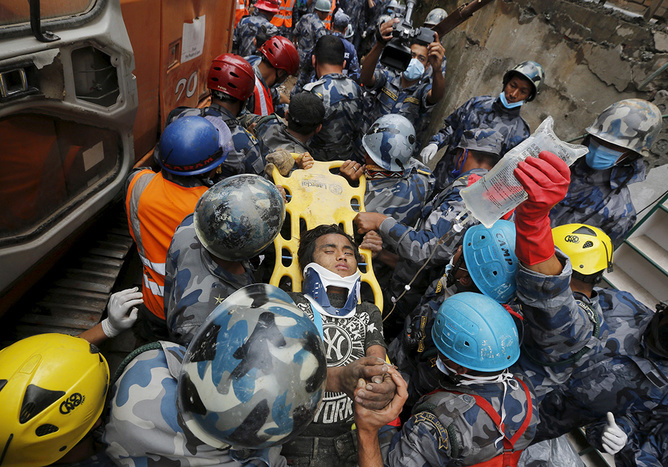 Nepalese are a very resilient people. They may appear modest and humble, but they are like their mountains – rugged, tough and amazing survivors. They’re known for their Gurkhas warriors, Sherpa mountain climbers and generous contribution to United Nations peacekeeping forces (seventh most in the world, despite its small size). Nepal is also known as the land of enlightenment and the birthplace of the Buddha (in 600 BC), the messenger of peace. Endowed with these virtues and characters, the country of Nepal will bounce back. About the author: Dr. Alok K. Bohara is a Full Professor of Economics and the founding director of the Nepal Study Center at the University of New Mexico (UNM).